The largest island in the Mediterranean, Sicily is separated from the tip of the Italian peninsula by the narrow Strait of Messina. Known as Sicilia in Italian, the island has an ancient history and has had many rulers. By the early nineteenth century the Kingdom of Sicily and the mainland Kingdom of Naples had been united under a Bourbon monarchy as the Kingdom of the Two Sicilies. During Italy's unification the Kingdom of the Two Sicilies was conquered by Sardinia in 1860-61 and incorporated in the new Kingdom of Italy in 1861. Today the island is an autonomous region of the Italian Republic. Sicily is divided into nine provinces, eight of which include portions of the coastline. 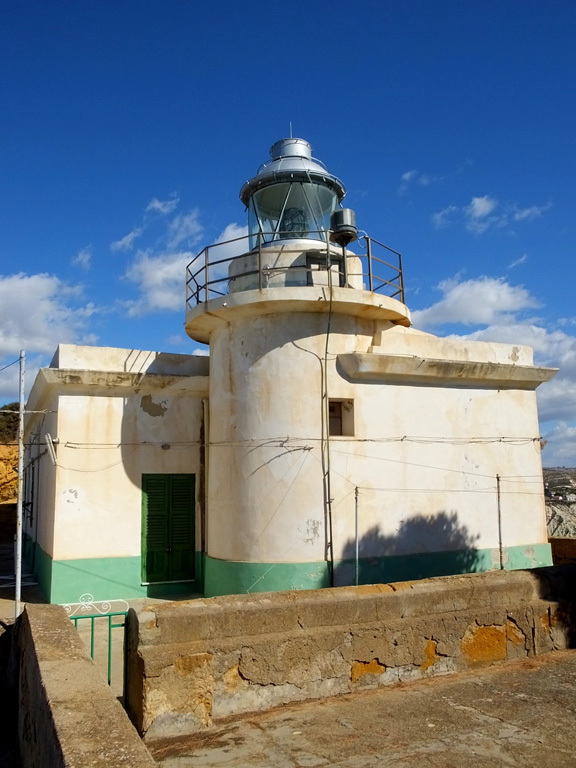 This page includes lighthouses of the three western provinces of Agrigento, Trapani, and Palermo. 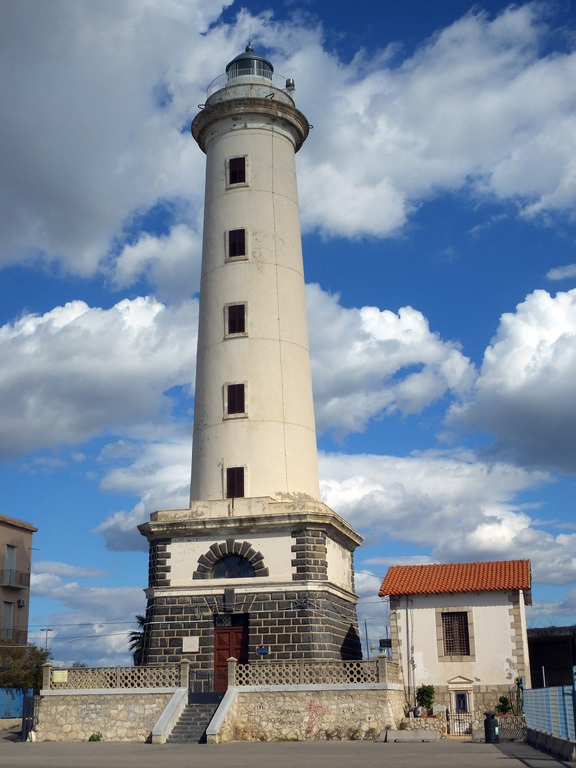 Lighthouses of Messina, Catania, Siracusa, and Ragusa are on the Eastern Sicily page. 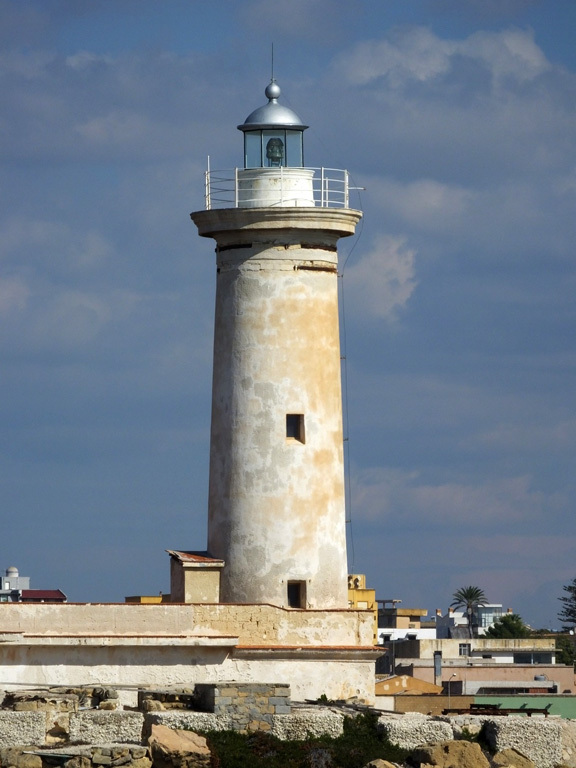 The Italian word for a lighthouse is faro, plural fari. This name is usually reserved for the larger coastal lights; smaller beacons are called fanali. 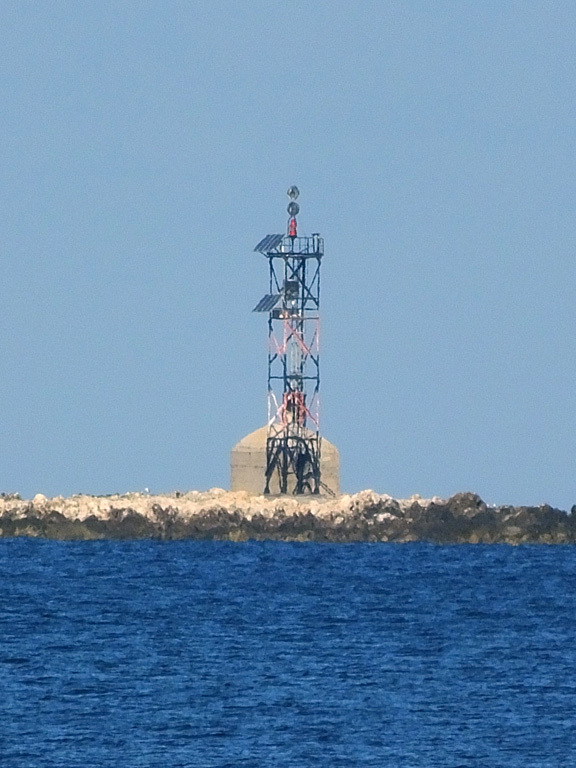 Aids to navigation are operated and maintained by the Italian Navy's Servizio dei Fari. Lighthouse properties are naval reservations, generally fenced and closed to the public. ARLHS numbers are from the ARLHS World List of Lights. EF numbers are from the Italian Navy's light list, Elenco dei Fari e Segnali da Nebbia. Admiralty numbers are from volume E of the Admiralty List of Lights & Fog Signals. U.S. NGA List numbers are from Publication 113. 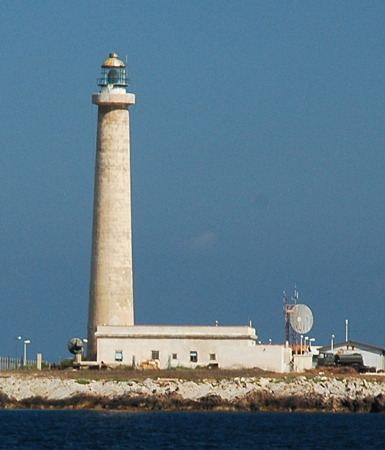 Lighthouse information from the Italian Navy's Servizio dei Fari. 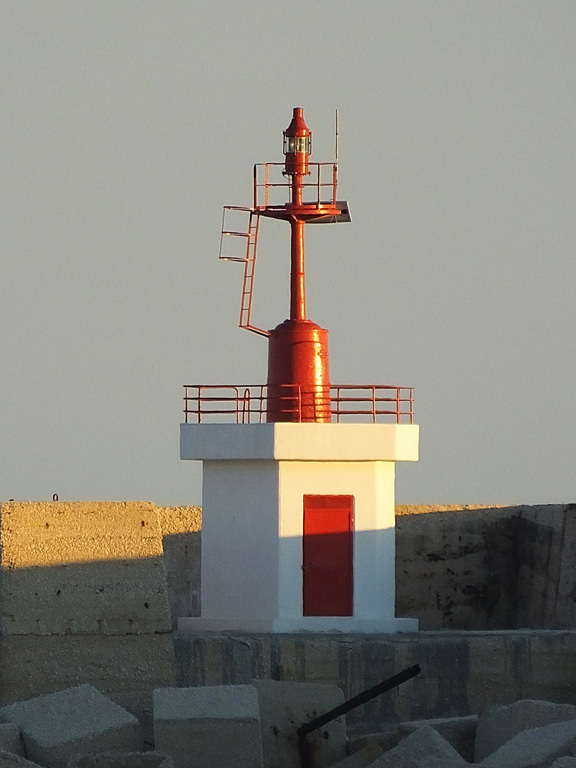 Photos of Italian lighthouses by Egidio Ferrighi, posted by Gary Richardson and Anna Klein. Photos by various photographers posted by Alexander Trabas. Most of the photos in this area are by Capt. Peter Mosselberger ("Capt. Peter"). The Strait of Sicily page includes the lights of the Pelagie Islands and Pantelleria. Photos and blog entries by Neal Doan. Photos by various photographers available in Wikimedia Commons. Note: The Pelagie Islands (Isole Pelagie) consist of three small islands, Lampedusa, Linosa, and Lampione, located roughly 200 km (125 mi) south of Sicily and 110 km (70 mi) east of Tunisia. The southernmost territories of Italy, these islands are considered by geologists to be part of the African continent. Although remote, Linosa and Lampedusa are popular tourist destinations and are readily accessible by ferry from Porto Empedocle. The total population of the islands is about 6000. 1890. Active; focal plane 32 m (105 ft); four white flashes every 20 s. 17 m (56 ft) round masonry tower with lantern and gallery, rising from a 1-story keeper's house. Lighthouse painted white; lantern dome is gray metallic. Simone Petralia has a closeup photo, a second photo is available, Wikimedia has a distant view, Capt. Peter has a view from the sea posted by the Degree Confluence Project, Trabas has Capt. Peter's closeup photo, and Bing has a satellite view. The closest of the islands to Sicily, Linosa is approximately square in shape and about 3 km (2 mi) in diameter. 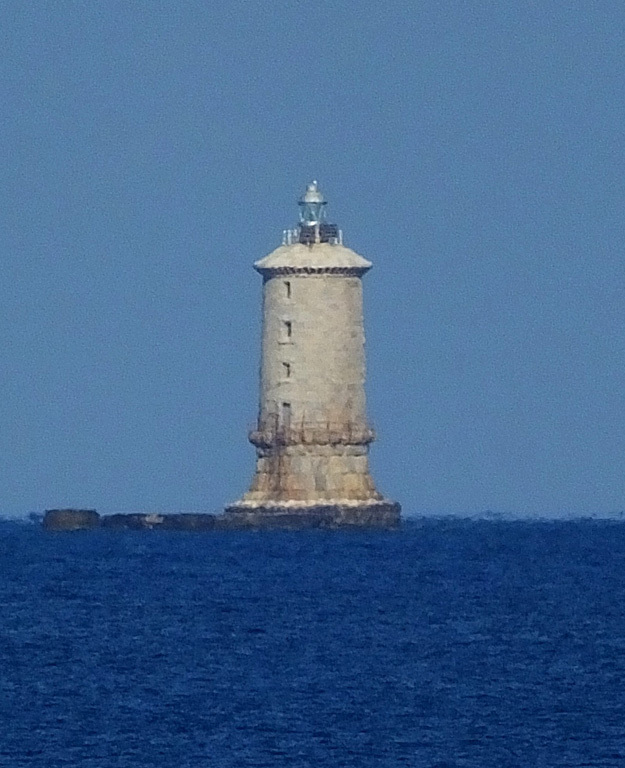 This lighthouse is located off the Via Fariglioni on the northeast corner of the island. Site open, tower closed. ARLHS ITA-123; EF-3054; Admiralty E2082; NGA 10468. Date unknown. Active; focal plane 9 m (30 ft); white flash every 5 s. 6 m (20 ft) post atop a square stone tower. Trabas has Capt. Peter's closeup photo, and Bing has a satellite view. More information is needed on this station; the current tower appears to be built on the foundations of an earlier lighthouse or keeper's house. Located on the Via Arena Bianca at the southwestern corner of Linosa. Site presumed open, tower closed. ARLHS ITA-304; EF-3058; Admiralty E2080; NGA 10472. 1855 (?). Active; focal plane 82 m (269 ft); white flash every 5 s. 19 m (62 ft) octagonal concrete tower with lantern and gallery, rising from the seaward side of a 1-story keeper's house. The lighthouse is unpainted white concrete; the lantern dome is gray metallic. Giorgio Cardellini's photo is at right, Trabas has Capt. Peter's photo, Martino Motti has a 2010 photo, Luca Siragusa has an aerial photo, Google has a closeup street view, and Bing has a good satellite view. 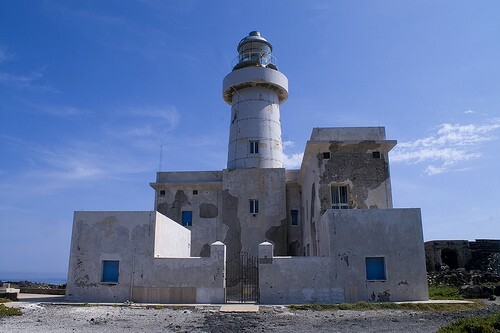 This is Italy's southernmost lighthouse. Located at the end of the Via Grecale on the northeastern tip of Lampedusa, north of Cala Creca. Site open, tower closed. ARLHS ITA-025; EF-3038; Admiralty E2088; NGA 10444. Date unknown. Active; focal plane 110 m (361 ft); three white flashes every 15 s. 5 m (17 ft) round "bottle" light, painted white. Trabas has Capt. Peter's photo, and Google has a satellite view. Located atop a spectacular cliff at the western tip of Lampedusa. Site open, tower closed. EF-3052; Admiralty E2086; NGA 10464. Date unknown. Active; focal plane 40 m (131 ft); two white flashes every 10 s. 6 m (20 ft) lantern mounted atop a small masonry keeper's house. 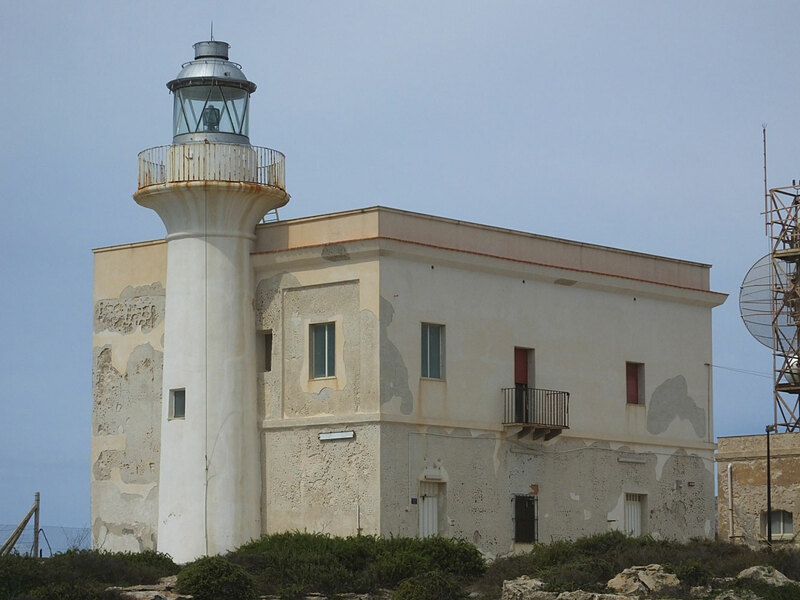 Trabas has Mauro Pancaldi's closeup photo, Wikimedia has a photo and a view from the sea, and the light is seen in an aerial photo (first photo on the page) by the Comune di Lampedusa e Linosa. Bing has only a distant satellite view of the island. Lampione means "lamppost," and with this light the tiny island has somewhat that appearance. 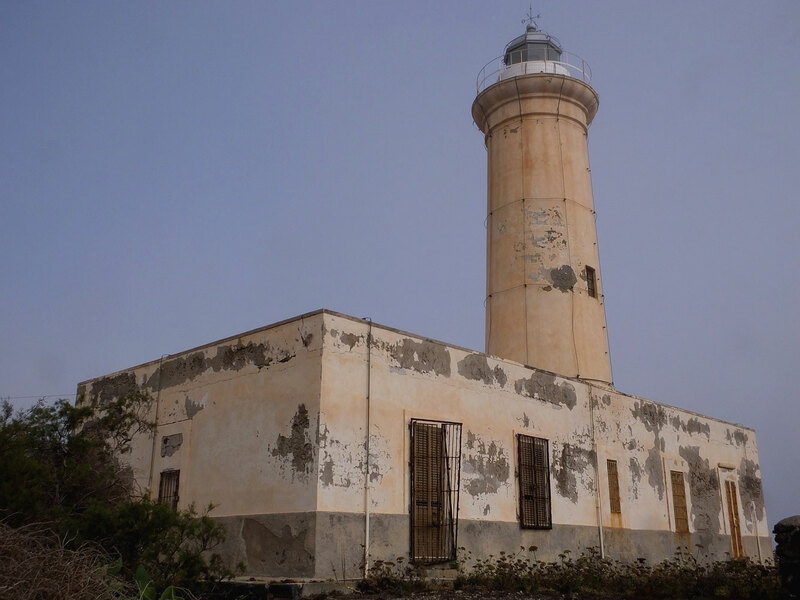 Located atop the islet of Lampione, about 15 km (9 mi) west of Lampedusa. Accessible only by helicopter. Site and tower closed. ARLHS ITA-301; EF-3064; Admiralty E2084; NGA 10476. Date unknown. Active; focal plane 10 m (33 ft); green flash every 5 s. 8 m (26 ft) round cylindrical concrete tower, at least the upper 2/3 painted green. Trabas has Capt. Peter's photo, and Google has a satellite view. Located at the end of the new east breakwater of Licata. Site status unknown. ARLHS ITA-199; EF-2962; Admiralty E1908; NGA 10132. 1895. 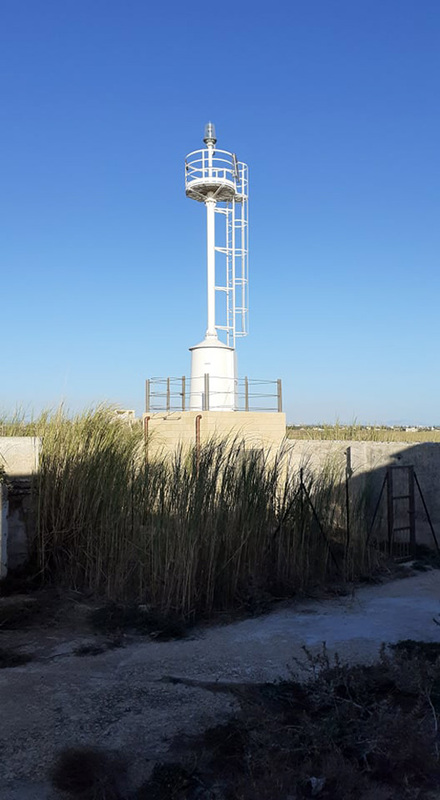 Active; focal plane 40 m (131 ft); white flash every 5 s. 37.5 m (123 ft) round concrete tower with lantern and gallery, mounted on a square masonry base. 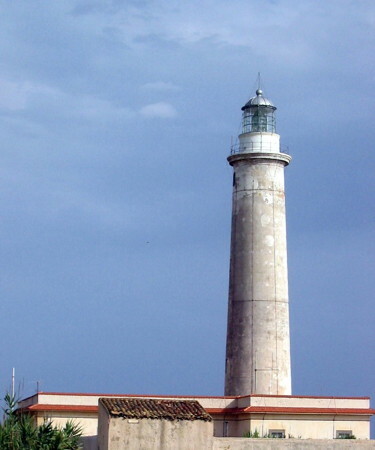 The lighthouse is unpainted white concrete; the lantern dome is gray metallic; the base is unpainted with white trim. Carlo Dambra's photo is at right, Trabas has Capt. Peter's closeup photo, Salvatore Lombardo has a 2011 photo, a third photo is available, Marinas.com has aerial photos, Huelse has a historic postcard view, and Google has a street view and a good satellite view. 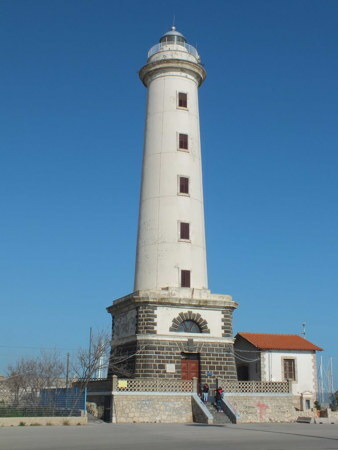 The lighthouse is located at the south end of the Corso Argentina, near the end of a large mole that helps shelter the east side of the harbor of Licata. Site open, tower closed. ARLHS ITA-157; EF-2954; Admiralty E1904; NGA 10128. Date unknown. Active; focal plane 11 m (36 ft); red flash every 5 s. 11 m (36 ft) round concrete tower with lantern and gallery. Upper third of the lighthouse painted red, lower 2/3 white. Trabas has a photo by Capt. Peter, and Google has a satellite view and a very distant street view. Located at the end of the original west breakwater of Licata, now inside the newer outer breakwater. Site and tower closed (breakwater is fenced). EF-2960; Admiralty E1906; NGA 10136. Date unknown (station established 1859). Active; focal plane 95 m (312 ft); two white flashes every 10 s. 10 m (33 ft) round tower with lantern and gallery, rising from a 1-story keeper's house. Lighthouse painted white; lantern dome is gray metallic. Trabas has Capt. Peter's photo, Pascal McLee has a photo, and Google has a satellite view. 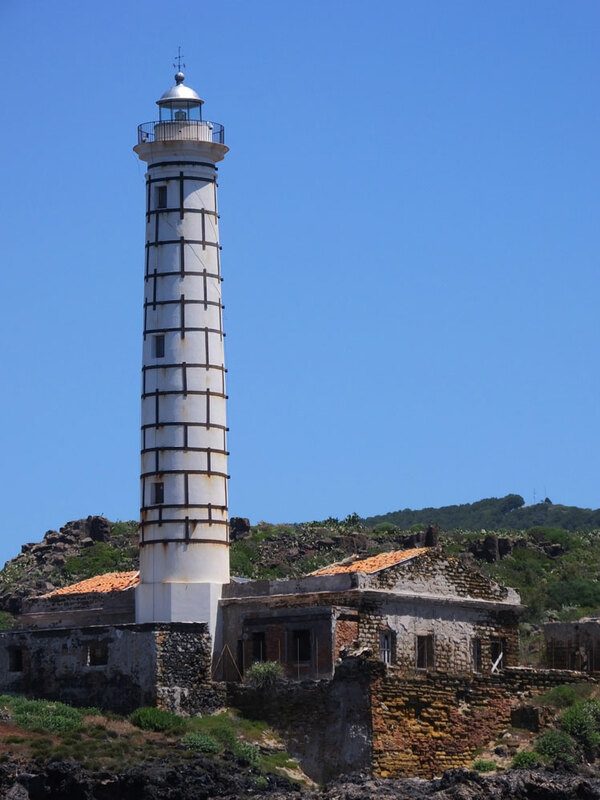 Located on a promontory on the west side of Baia di Rossello, about 6 km (4 mi) west of the harbor of Porto Empedocle. Site status unknown, but it should be possible to view the lighthouse from nearby beaches. ARLHS ITA-034; EF-2998; Admiralty E1922; NGA 10112. Date unknown (station established 1885). Active; focal plane 25 m (82 ft); three white flashes every 15 s. 11 m (36 ft) concrete post centered on a 1-story equipment building. Entire structure is white. Trabas has Capt. Peter's photo, Danuta Kunysz has a photo, another photo is available, and Google has a satellite view. 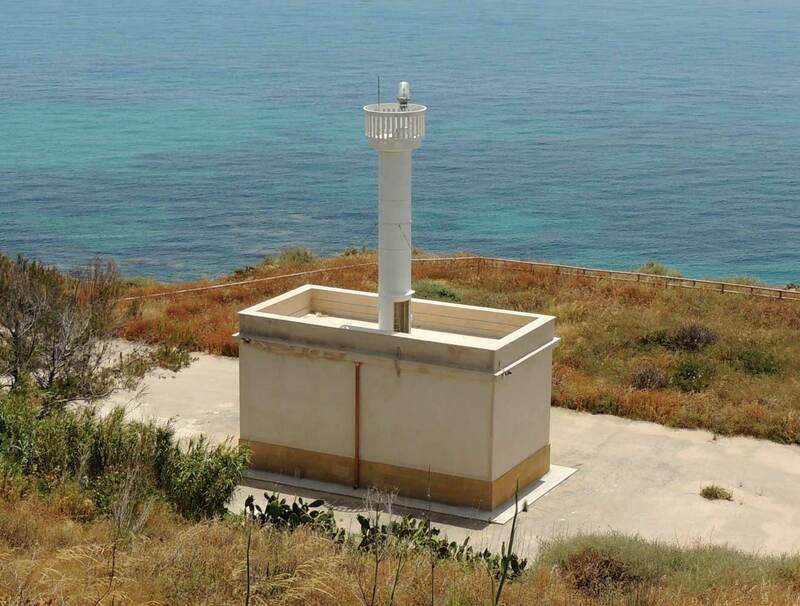 Located at the end of the Via del Faro about 5 km (3 mi) west of the harbor of Sciacca. Site should be open, tower closed. ARLHS ITA-038; EF-3006; Admiralty E1928.5; NGA 10094. Note: Pantelleria is an island in the Strait of Sicily, about 100 km (60 mi) southwest of the southwestern coast of Sicily and 70 km (45 mi) east of the coast of Tunisia. The island is about 15 km (9 mi) long and 8 km (5 mi) wide and has a permanent population of about 6000. It is attached to the Sicilian province of Trapani and is accessible by air or by ferry from Trapani. Date unknown (station established 1881). Active; focal plane 21 m (69 ft); white flash every 3 s. Light mounted atop a 2-story building. Trabas has Capt. Peter's closeup photo, Google has a street view, and Bing has a satellite view. Located on the east side of the entrance to the harbor of Pantelleria, and the northwestern end of the island. Site presumably open, tower closed. ARLHS ITA-110; EF-3018; Admiralty E2098; NGA 10500. 1884. Active; focal plane 50 m (164 ft); two white flashes every 10 s. 21 m (69 ft) round masonry tower with lantern and gallery, rising from a 2-story masonry keeper's house. Entire lighthouse painted white. Gianluca Carcinella's photo is at right, Trabas has Capt. Peter's photo, a 2008 photo is available, Google has a street view, and Bing has a satellite view. Most photos indicate that the lighthouse is in rather poor condition. Located on the northeast side of the island, about 7 km (4.5 mi) east of the town of Pantelleria. Accessible by road. Site open, tower closed. ARLHS ITA-146; EF-3014; Admiralty E2094; NGA 10480. Date unknown. Active; focal plane 49 m (161 ft); two white flashes every 10 s. 7 m (23 ft) white round cylindrical tower. Trabas has Capt. Peter's photo and Google has an indistinct satellite view. Located on a sharp cape at Tracino on the northeast coast of the island. Site open, tower closed. ARLHS ITA-253; EF-3037; Admiralty E2107; NGA 10484. Date unknown. Active; focal plane 35 m (115 ft); three white flashes every 15 s. 5 m (17 ft) round "bottle" light, painted white. Trabas has Capt. Peter's photo and Bing has a satellite view. Located atop a sharp, rocky point at the southeastern tip of Pantelleria. Site open, tower closed. EF-3036; Admiralty E2106; NGA 10492. Date unknown (station established 1865). Active; focal plane 37 m (121 ft); white light, 3 s on, 7 s off. 35 m (115 ft) round tower with lantern and gallery, rising from a 1-story keeper's house. Entire lighthouse painted white. Paolo Alfieri's photo is at right, Trabas has a good photo by Capt. Peter, Marinas.com has aerial photos, and Google has a street view and a satellite view. Capo Granitola is the most prominent cape at the southwestern corner of Sicily. 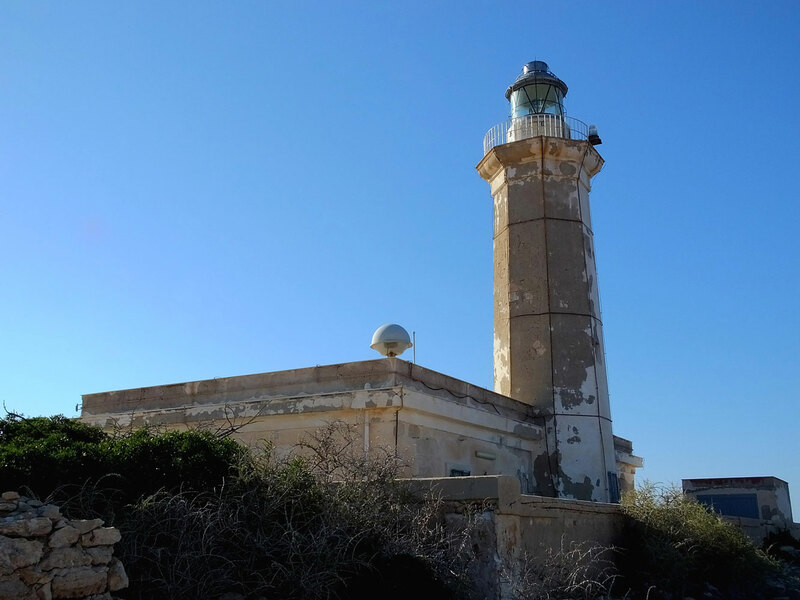 Located on the point of the cape about 2.5 km (1.5 mi) southeast of Torretta Granitola and 12 km (7.5 mi) southeast of Mazara del Vallo. ARLHS ITA-024; EF-3010; Admiralty E1930; NGA 10092. Date unknown. Active; focal plane 13 m (43 ft); red flash every 4 s. 8 m (26 ft) bottle light mounted on a hexagonal 1-story stone equipment shelter. Light tower painted red, equipment shelter white. Trabas has Capt. Peter's closeup photo and Google has a satellite view. 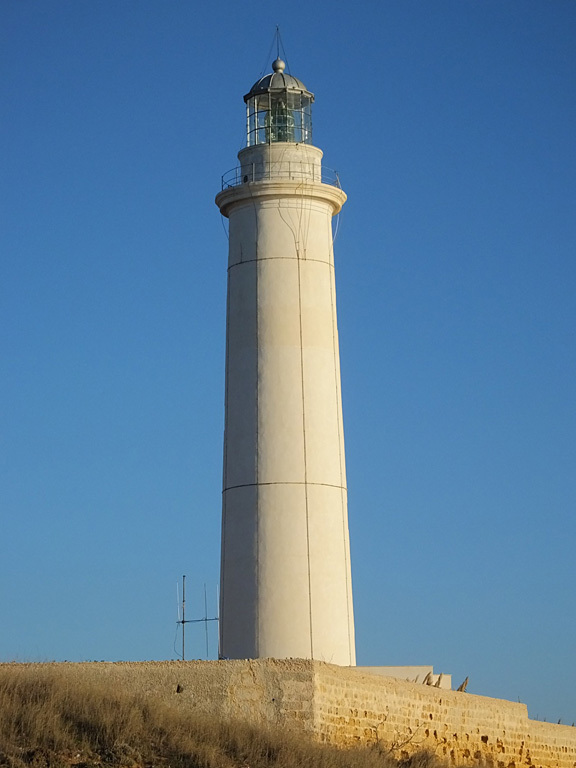 Located at the end of the west (main) breakwater of Mazara del Vallo. Accessible by walking the pier. Site open, tower closed. EF-3066; Admiralty E1932; NGA 10080. 1915. Active; focal plane 14 m (46 ft); white light, 2 s on, 8 s off. 10 m (33 ft) post light mounted on a square building. Tower painted white with one black horizontal band. Trabas has Capt. Peter's photo, Marcello Romano has a photo (third photo on the page), and Google has a satellite view. This light appears to be accessible, so the scarcity of photos is puzzling. The area is part of a nature reserve. 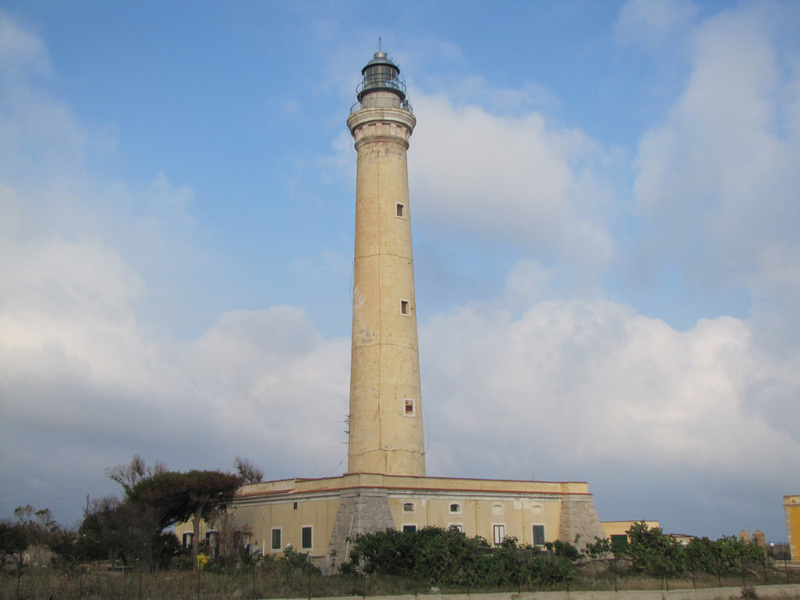 Located on a headland about 4 km (2.5 mi) west of the harbor of Mazara del Vallo. Site status unknown. ARLHS ITA-190; EF-3076; Admiralty E1938; NGA 10076. 1884 (?) (station established 1849). Active; focal plane 19 m (62 ft); two white flashes every 10 s. 19 m (62 ft) tower with lantern and gallery, attached to a 1-story keeper's house. The entire lighthouse is painted white (or may be unpainted white concrete). Trabas has a good photo by Capt. Peter, Wikimedia has a photo, a view from the waterfront is available, and Google has a satellite view and a street view along the mole. 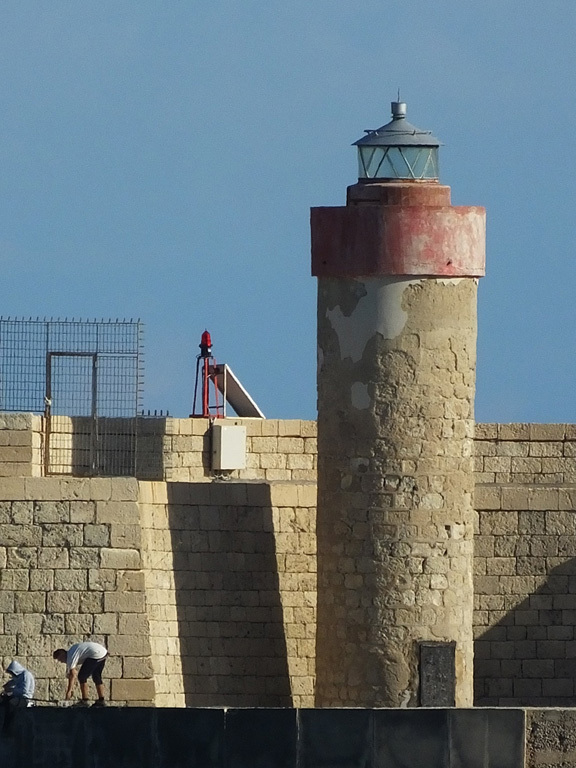 Located at the original end of the Molo Cristoforo Columbo, the west inner breakwater of Marsala (the mole has been extended). The absence of closeup photos suggests that this mole is not open to the public. Site and tower closed. ARLHS ITA-102; EF-3080; Admiralty E1940; NGA 10064. Note: The Aegadian Islands (Isole Egadi) are an archipelago of mountainous islands scattered off the west coast of Sicily west of Trapani. The principal islands of Favignana, Levanzo, and Marettimo are all accessible by ferry from Trapani. Date unknown (station established 1856). 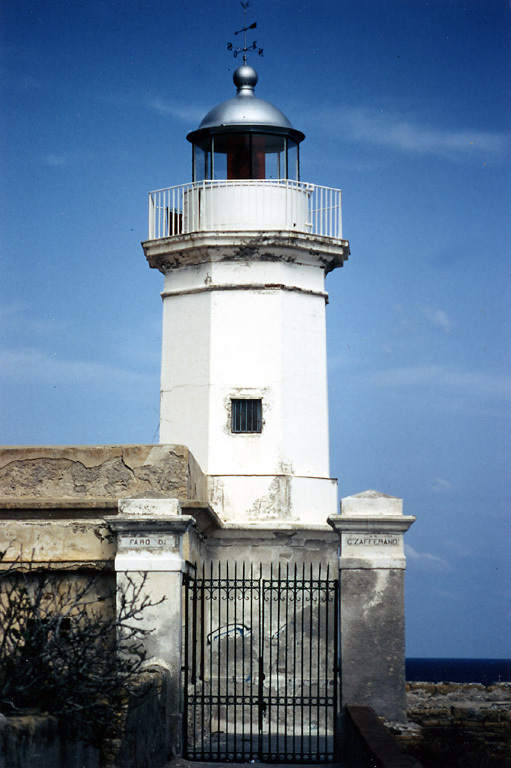 Active; focal plane 20 m (66 ft); four white flashes every 15 s. 15 m (49 ft) round tower with lantern and gallery, painted white; lantern dome is gray metallic. 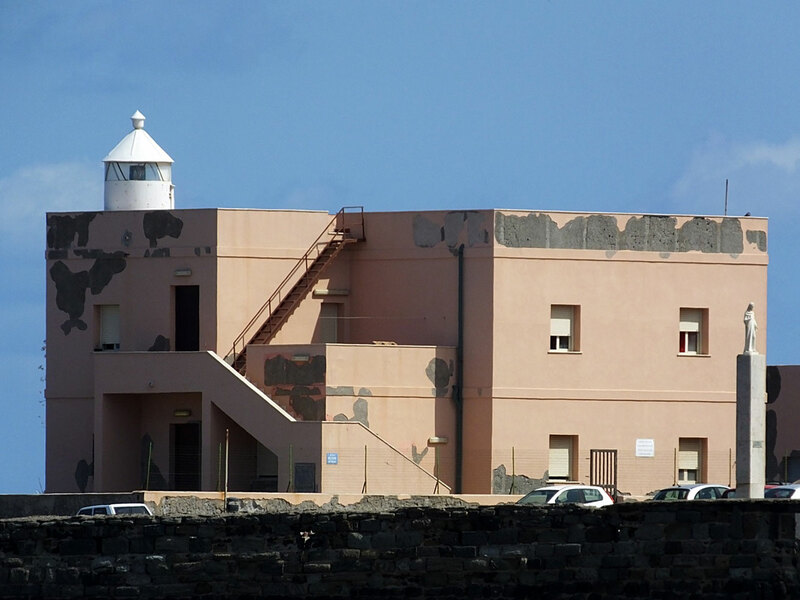 Adjacent to the lighthouse is a modern 2-story concrete or masonry building, also painted white. Trabas has Capt. Peter's closeup, Google has a street view, and Bing has a satellite view. Located on the southeastern tip of Favignana, only 7 km (4.5 mi) from the mainland of Sicily. Site and tower closed, but the lighthouse can be seen from nearby. ARLHS ITA-135; EF-3100; Admiralty E1948; NGA 10016. 1904 (station established 1860). Active; focal plane 43 m (141 ft); white flash every 8 s. 38 m (125 ft) round masonry tower rising from a 1-story U-shaped keeper's house. The lighthouse appears to be unpainted white concrete; lantern dome is gray metallic. Greg Robbins's photo is at right, amateur radio operator Albert Mattei (IT9MRM) has posted several good photos, Trabas has Capt. Peter's closeup, Marinas.com has aerial photos, and Google has a street view and a satellite view. One web site says the lighthouse had a "radical transformation" in 1904, but this transformation seems to have been a new tower. 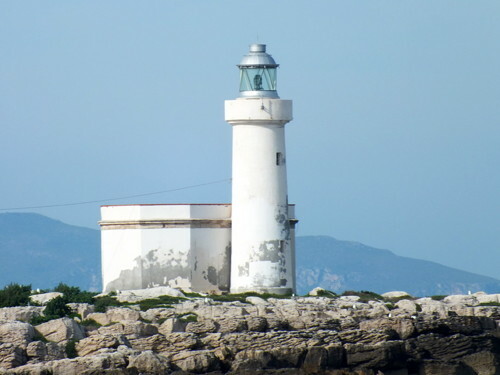 The lighthouse is similar but not identical to the San Vito lo Capo lighthouse. Located at the western tip of Favignana, the largest and most populous of the islands. Accessible by road. Site open, tower closed. ARLHS ITA-145; EF-3104; Admiralty E1952; NGA 10020. 1867. Active; focal plane 73 m (240 ft); two white flashes every 15 s. 24 m (79 ft) octagonal masonry tower with lantern and gallery, rising from a 2-story masonry keeper's house. 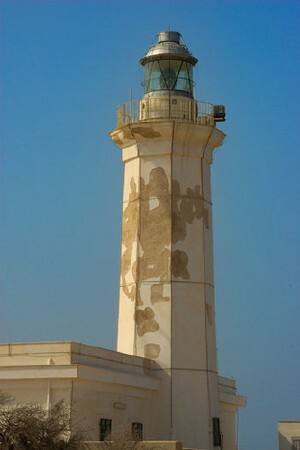 Lighthouse painted white with a very narrow dark green horizontal band; a similar band is painted on the keeper's house. Marcel Strasser has a closeup photo, Trabas has Capt. Peter's photo, Marinas.com has aerial photos, Maurizio Sciarra has a 2016 street view, and Google has a satellite view. Located on the southwest coast of Marettimo, the most remote of the islands, about 35 km (22 mi) west of Trapani. Access is a bit uncertain, but there is a road near the lighthouse. Site open, tower closed. ARLHS ITA-133; EF-3112; Admiralty E1956; NGA 10004. 1958. Active; focal plane 68 m (223 ft); three white flashes every 15 s. 12 m (39 ft) round concrete tower with lantern and gallery, rising from a 1-story keeper's house. Tower painted white; lantern dome is gray metallic. Trabas has Capt. Peter's photo, Marinas.com has aerial photos, and Google has a satellite view. In 2016 the light station was leased for development as a boutique resort with 6 rooms for overnight accommodation. 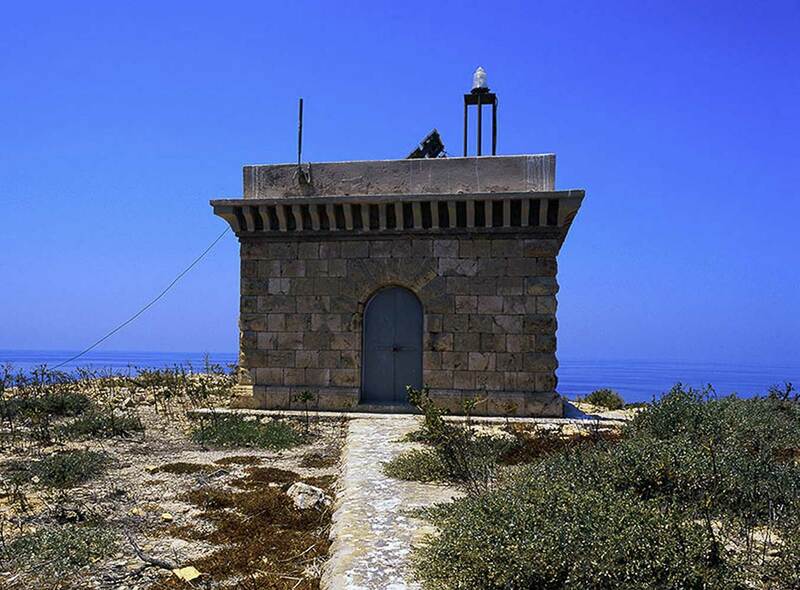 Located atop a spectacular cliff on the northern tip of Levanzo. Accessible by road. Site open, tower closed. ARLHS ITA-208; EF-3120.3; Admiralty E1962; NGA 10000. Date unknown (station established 1858). Active; focal plane 28 m (92 ft); white flash every 4 s. 20 m (66 ft) round concrete tower with lantern and gallery, rising from one corner of a 17th century fortress. Tower painted white. Trabas has Capt. Peter's photo, Filippo Parrinello has a good photo, and Google has a satellite view. Isolotto Formica is a small island halfway between Levanzo and the mainland of Sicily. 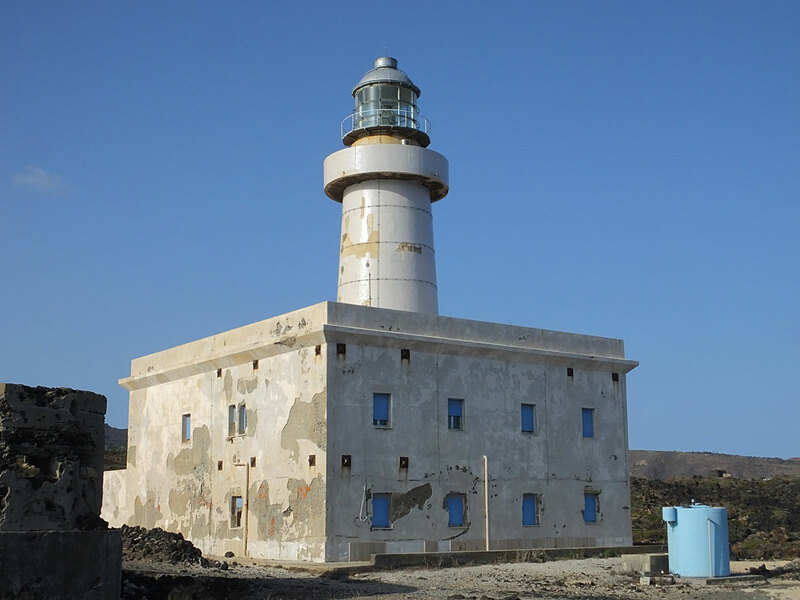 The island is covered by a complex of buildings, an abandoned tonnara (tuna cannery). Accessible only by boat, but there's a distant view from ferries between Trapani and Levanzo. ARLHS ITA-091; EF-3128; Admiralty E1966; NGA 10032. Date unknown. Active; focal plane 16 m (52 ft); white flash every 5 s. 13 m (43 ft) round masonry tower with lantern and gallery, adjacent or attached to an octagonal 1-story keeper's house. Tower painted white. Trabas has a good photo by Arno Siering (also seen at right), David Salvatori has a 2007 view from the Trapani waterfront, Marinas.com has aerial photos, and Google has a satellite view. Located on a rock about 800 m (1/2 mi) west of the harbor entrance at Trapani. Accessible only by boat, but there should be good views from shore and excellent views from ferries departing for the Aegadian Islands. Site and tower closed. ARLHS ITA-161; EF-3138; Admiralty E1970; NGA 10044. Date unknown. Active; focal plane 10 m (33 ft); continuous green light. 6 m (20 ft) post centered on a square 1-story equipment building. 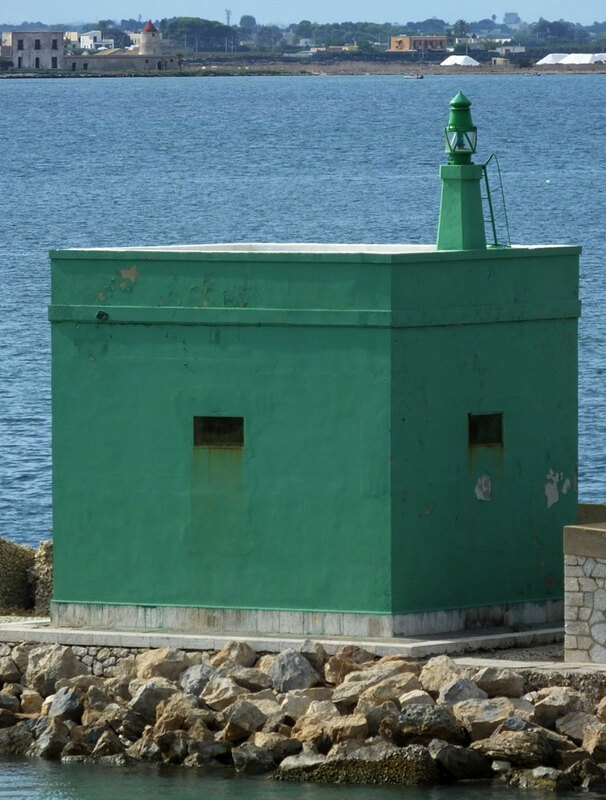 Entire lighthouse painted green. Trabas has Capt. Peter's photo and Google has a street view and a satellite view. 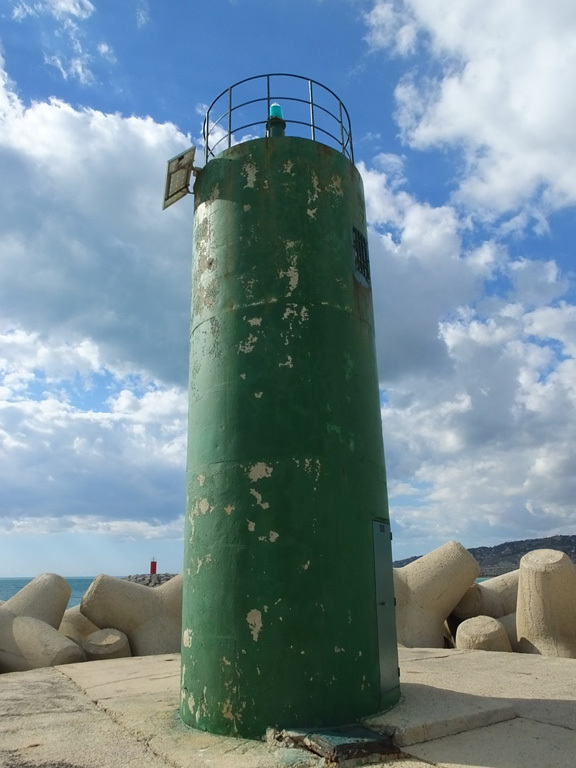 Located on a short breakwater on the south side of the entrance to the inner harbor of Trapani. Accessible by walking the pier. Site open, tower closed. EF-3156; Admiralty E1978; NGA 10052. 1855. Inactive since sometime before 1920. Approx 38 m (125 ft) octagonal cylindrical stone tower, part of a medieval castle. The Trapani tourist office has a page for the castle, Giuseppe Fontana has a closeup street view, and Google has a satellite view. The castle has roots going back to the Carthaginians around 200 BC, but the tower that carried the light was begun in the 14th century and completed by Philip II of Spain in 1586. Although proposed as a tourist attraction, the castle does not appear to be open to the public at present. 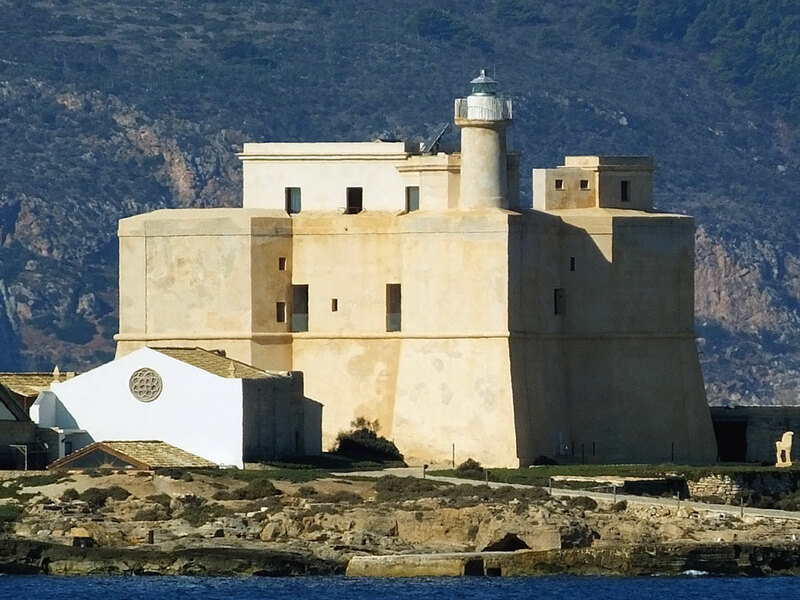 Located on the Isola Colombaia, an island at the entrance to Trapani harbor. Accessible only by boat. Site and tower closed. ARLHS ITA-307. 1904. Active; focal plane 23 m (75 ft); two white flashes every 10 s. 25 m (82 ft) round stone tower with lantern and gallery, incorporating keeper's quarters. Tower painted white. Trabas has Capt. Peter's photo, and an excellent 2009 photo is available. Located on one of an isolated group of rocks forming a reef about 6 km (3.5 mi) northwest of Trapani. Accessible only by boat. Site open, tower closed. ARLHS ITA-162; EF-3132; Admiralty E1968; NGA 10036. Date unknown. Active; focal plane 13 m (43 ft); two white flashes every 6 s. 11 m (36 ft) square skeletal tower, painted with black and red horizontal bands. 1-story keeper's house or equipment building. Trabas has Capt. Peter's photo, and Google has a satellite view. Located on a rocky islet about 10 km (6 mi) north of Trapani. Accessible only by boat. Site open, tower closed. EF-3166; Admiralty E1982; NGA 10040. Date unknown (station established 1859). Active; focal plane 45 m (148 ft); white flash every 5 s; also a red light, 2 s on, 2 s off, is shown over shoals to the north from a focal plane of 12.5 m (41 ft). 40 m (131 ft) tower with lantern and gallery, painted white and attached to a 1-story keeper's house. Gallery and watch room painted white; the lantern dome is gray metallic. A photo is at right, Trabas also has a good photo by Egidio Ferrighi, Andrzej Tenderenda has a 2016 photo, Marinas.com has aerial photos, and Google has a good street view and a satellite view. The promontory of Capo San Vito marks the northwestern corner of Sicily. 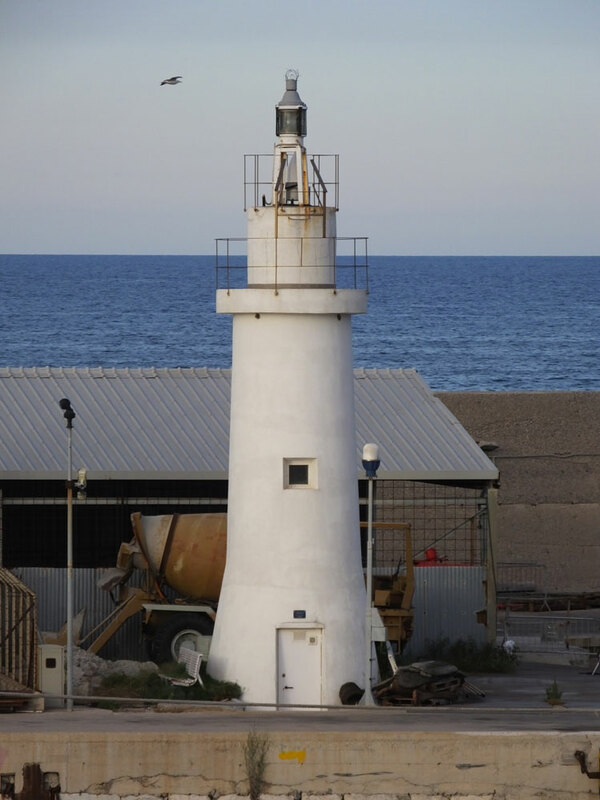 Note: there is a second Capo San Vito lighthouse near Taranto on the Italian mainland. 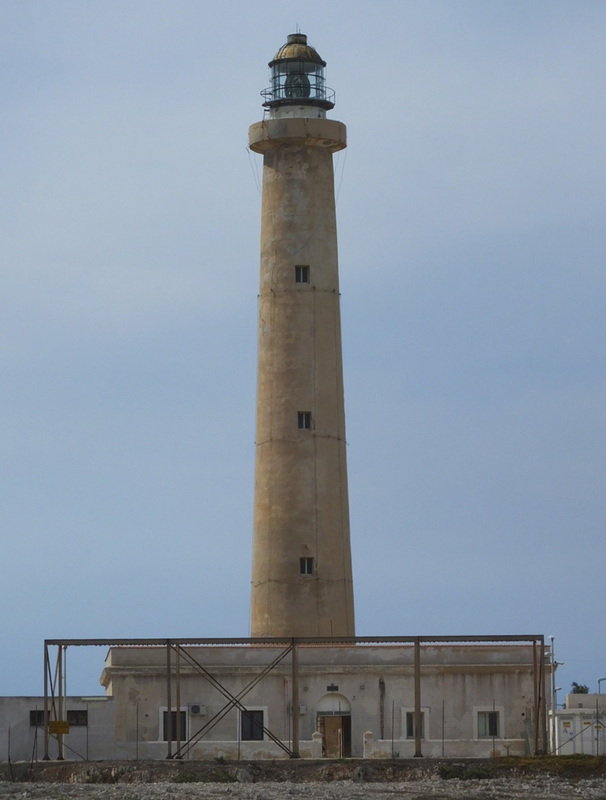 Located at the end of the Via Faro in San Vito lo Capo. Site open, tower closed. ARLHS ITA-155; EF-3170; Admiralty E1986; NGA 9988. Date unknown. Active; focal plane 25 m (82 ft); flash every 3 s, white or red depending on direction. 5 m (17 ft) light mounted on the roof of a square 1-story concrete equipment building. Lighthouse painted white; the small lantern is red. Trabas has a photo by Arno Siering, Mirko Mannarino has a closeup street view, and Google has a satellite view. 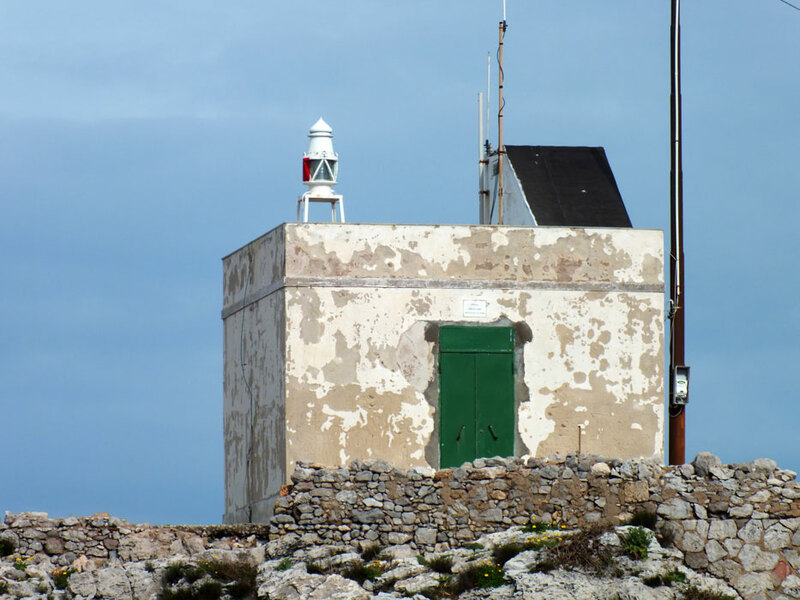 The ruins of a 16th century watch tower, the Torre Usciere, stand next to the light. 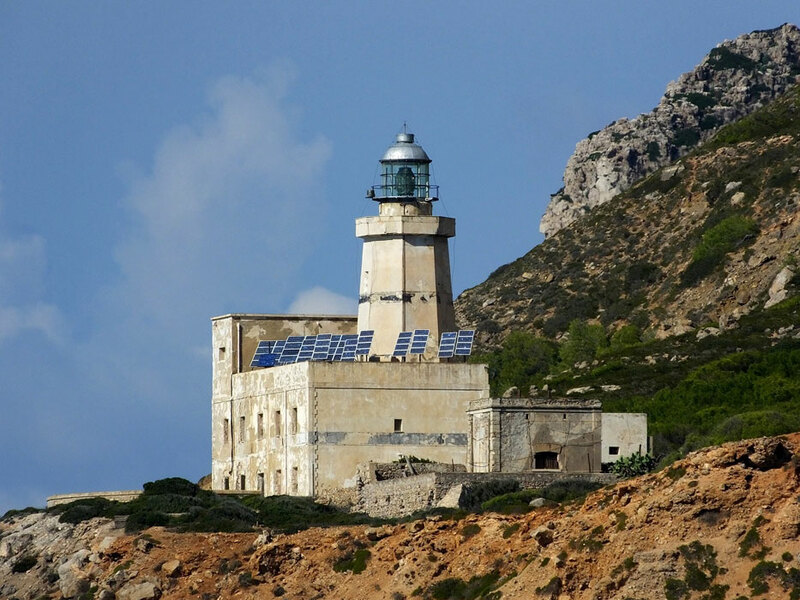 Located on the northeast point of the Capo San Vito peninsula, about 4 km (2.5 mi) east of the Faro San Vito lo Capo. Site open, tower closed. ARLHS ITA-279; EF-3178; Admiralty E1990; NGA 9984. Date unknown. Active; focal plane 19 m (62 ft); two white flashes every 10 s. Light atop a square 1-story concrete equipment building standing atop a round medieval fortification. Trabas has Capt. Peter's closeup photo, Wikimedia has a good photo, and Google has a street view and a satellite view. The castle was begun by the Arabs in the ninth century and expanded by the Normans in the eleventh century. Located on a promontory projecting into the harbor of Castellammare del Golfo. Site open, tower closed. EF-3182; Admiralty E1992; NGA 9968. Note: Ustica is a small island in the Tyrrhenian Sea 52 km (33 mi) north of Capo Gallo. The island has a permanent population of about 1300 and is accessible by ferry from Palermo. 1884. Active; focal plane 100 m (328 ft); three white flashes every 15 s; also a red light, occulting once every 5 s, is shown over a shoal to the northeast. 10 m (33 ft) tower with lantern and gallery, rising from the seaward end of a 1-story keeper's house. Tower painted white. David Salvatori's 2008 photo is at the top of this page, and Jón Pétur Magnason has a view from the sea, Trabas has Capt. Peter's closeup photo, Sergey Kolobanov has a street view from a nearby hiking trail, and Google has a satellite view. Punta Omo Morto means "Deadman Point," a reference to the extreme danger sailors face here. 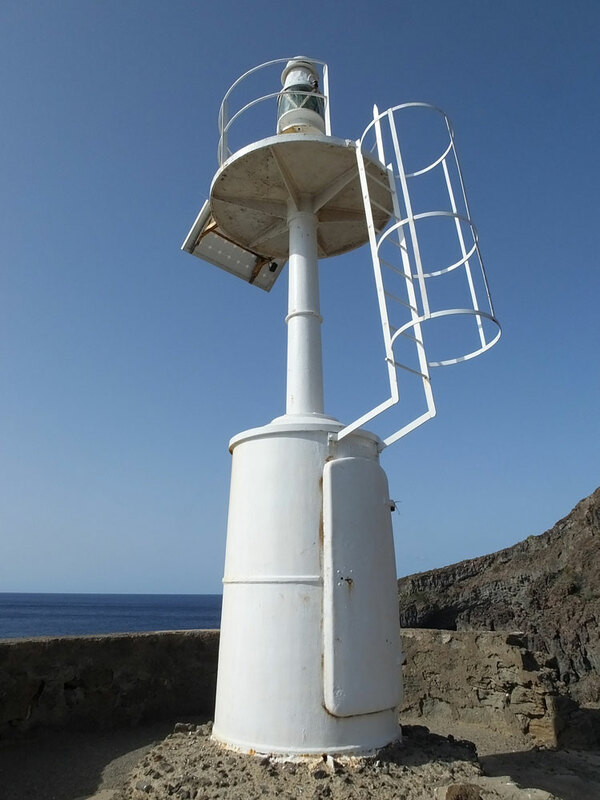 Located atop a steep promontory at the northeast end of the island of Ustica, about 800 m (1/2 mi) northeast of the village of Ustica. 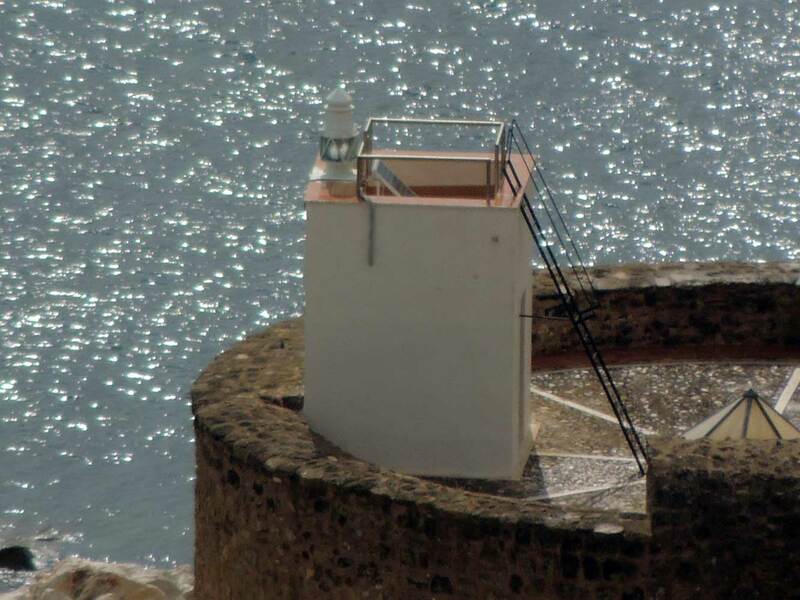 The lack of closeup photos confirms that access to this lighthouse is difficult, but it is possible to get a view from the heights above the town. Site and tower closed. ARLHS ITA-136; EF-3186; Admiralty E1996; NGA 9956. 1885. Active; focal plane 40 m (131 ft); four white flashes every 12 s. 28 m (92 ft) tower with lantern and gallery, attached to a 1-story keeper's house. The lighthouse appears to be covered with unpainted white concrete panels; lantern dome is gray metallic. A photo is at right, David Salvatori has a 2008 photo, Jón Pétur Magnason has a good photo, Trabas has Capt. Peter's closeup photo, Jacopo Famularo has a street view, and Google has a satellite view. 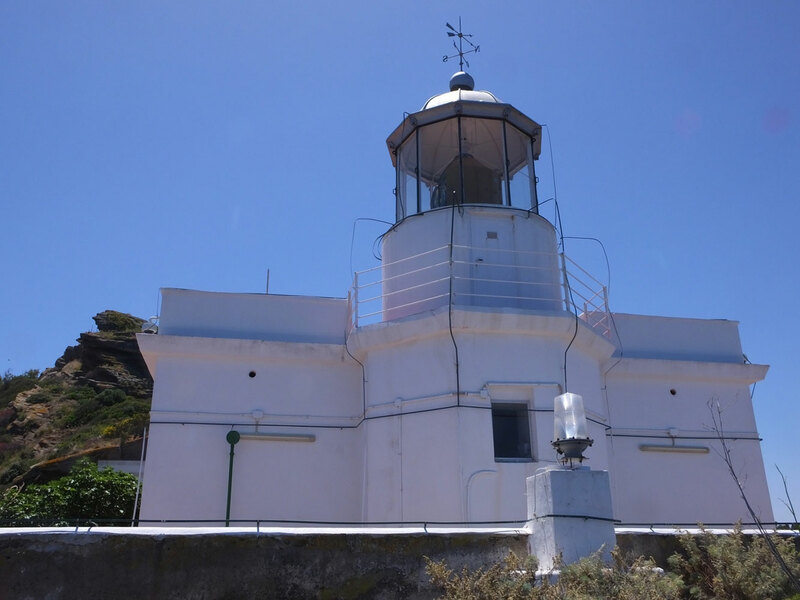 In 2015 the Navy offered a long-term lease of the light station for restoration and tourist development. 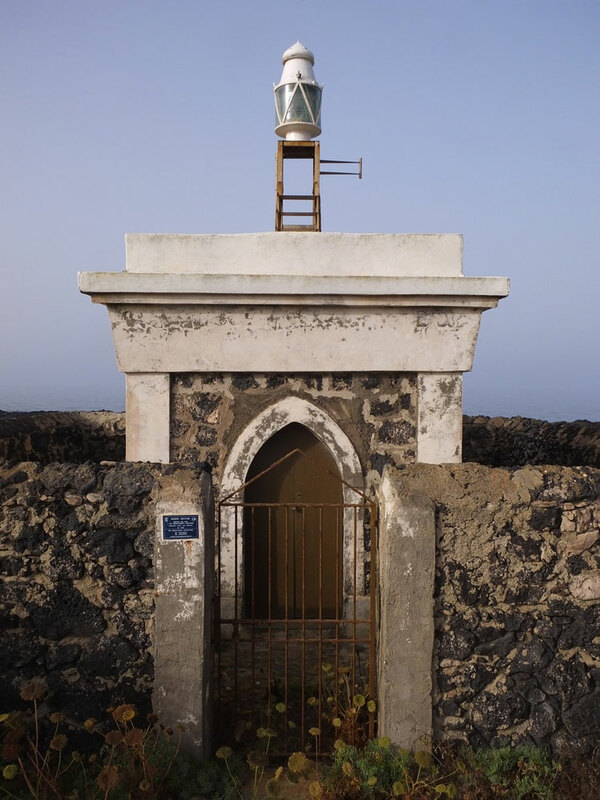 Located at the southwestern tip of the island of Ustica. Accessible by road. Site open, tower closed. ARLHS ITA-125; EF-3194; Admiralty E2000; NGA 9964. 1854. Active; focal plane 40 m (131 ft); two long (2 s) white flashes every 15 s. 8 m (26 ft) round cylindrical concrete tower with lantern and gallery, attached to the seaward side of a 1-story keeper's house. Tower painted white; lantern dome is gray metallic. Trabas has a fine photo by Capt. Peter, Wikimedia has a photo and a dramatic view from the sea, Marinas.com has aerial photos, Antonino Coronati has a street view, and Google has a satellite view. The keeper's house is the 1854 original, but the lantern and light tower appear to be more recent. 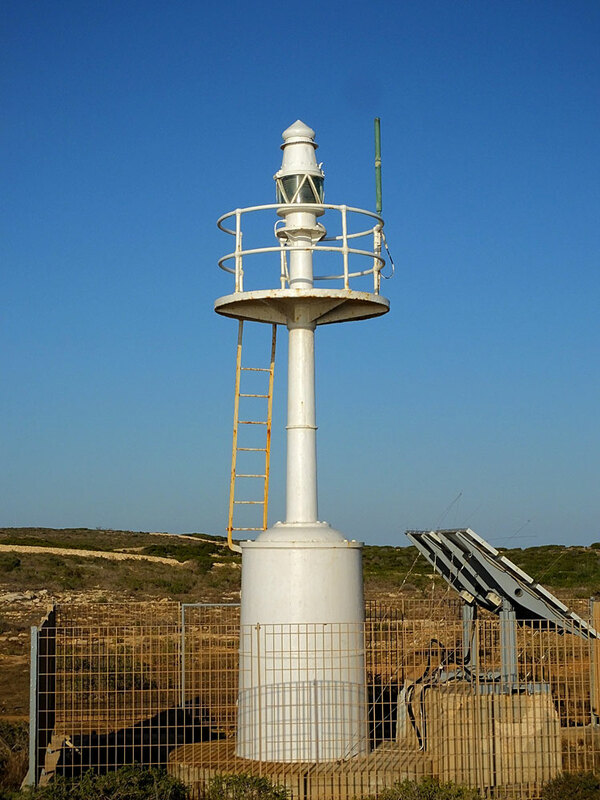 The area of the cape is a nature reserve, and according to earlier reports the station was being converted to a marine research facility. 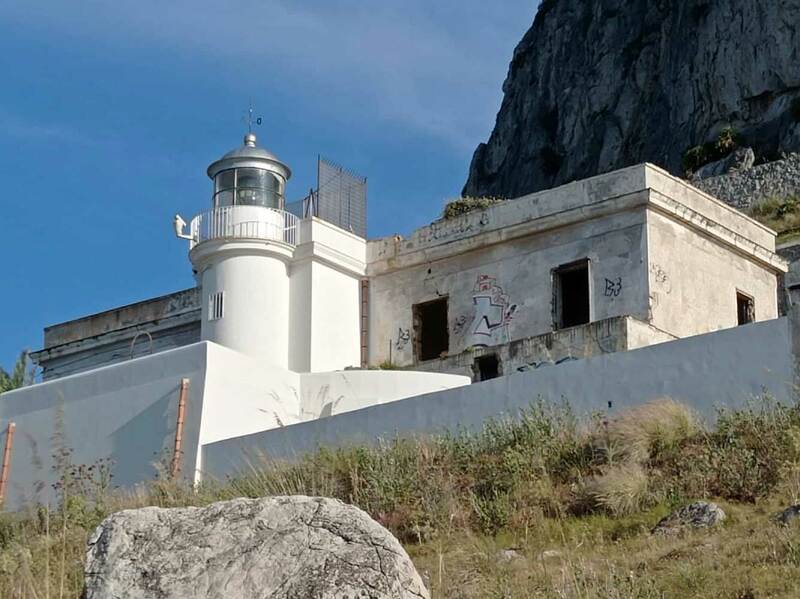 The buildings are endangered by erosion of the steep slope between the lighthouse and the sea. Capo Gallo marks the western entrance to the Golfo di Palermo. 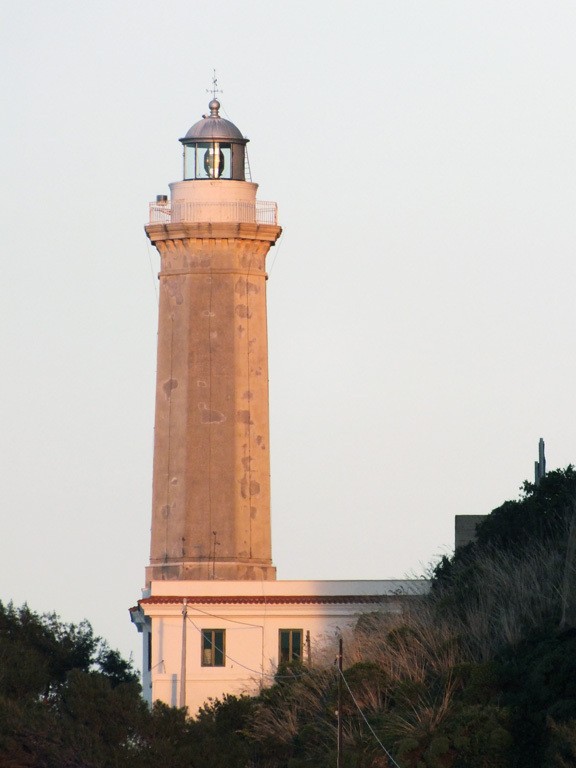 Located on the point of the cape, at the end of the Via Gallo, about 8 km (5 mi) north of the Palermo waterfront. Site open, tower closed. ARLHS ITA-023; EF-3198; Admiralty E2004; NGA 9936. Date unknown. Active; focal plane 15 m (49 ft); four white flashes every 15 s. 11 m (36 ft) round concrete tower with gallery. Doan has a page for the lighthouse, James O'Rear has a closeup photo, Trabas has Capt. Peter's photo, and Google has a satellite view. Located at the original end of the main breakwater, which has since been extended. Site and tower closed. ARLHS ITA-201; EF-3208; Admiralty E2008; NGA 9908. 1884 (? )(station established 1853). Inactive. Approx. 18 m (59 ft) octagonal concrete tower with lantern and gallery, rising from a 2-story building. The tower is unpainted; gallery painted white; lantern dome is gray metallic. Photos of this historic lighthouse are curiously scarce, and we have no information on its history. Capt. Peter's photo is at right, Enrico Veneruso has a 2016 photo, George Saguna has a harbor view, and Google has a satellite view. 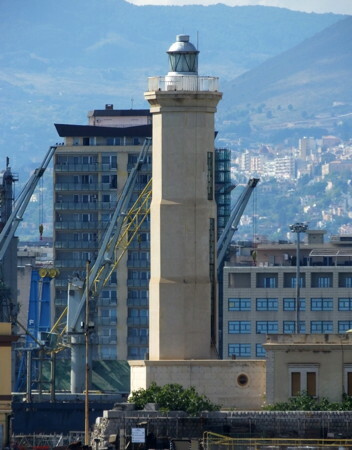 The light was replaced by the tower on the main breakwater of Palermo (previous entry). 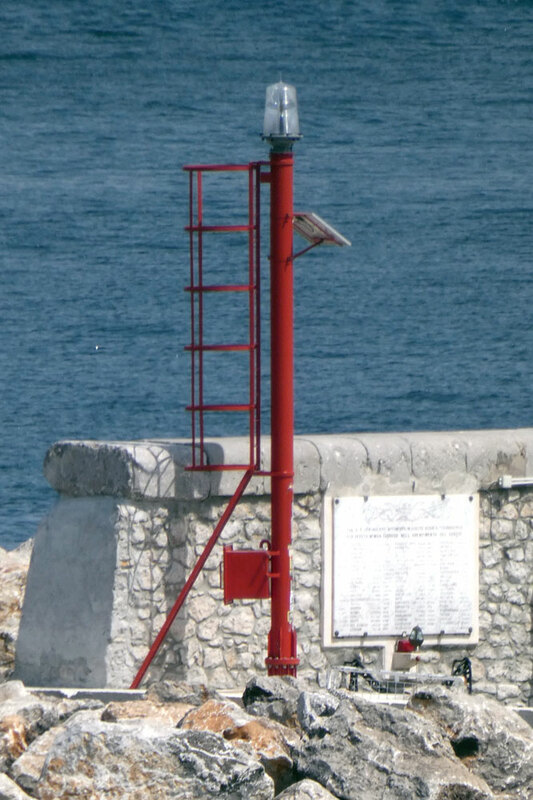 Located on the north mole at the point at which the breakwater is attached, near the foot of the Via Cristoforo Columbo. Site and tower closed (this is an industrial area) but the lighthouse should be visible easily from nearby. ARLHS ITA-302; ex-Admiralty E2008. Date unknown. Active; focal plane 9.5 m (31 ft); red light, 2 s on, 3 s off. 8 m (26 ft) round cylindrical tower with lantern and gallery, attached to a 1-story pierhead building. Lighthouse painted with red and white horizontal bands. 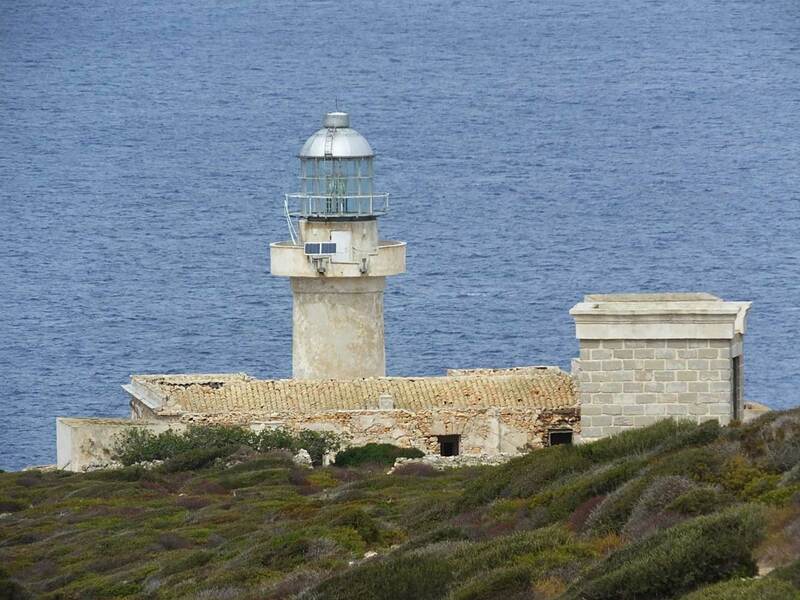 Doan has a page for the lighthouse, Trabas has Capt. Peter's photo, and Google has a satellite view. Located at the end of the short south breakwater of Palermo harbor. Site status unknown. ARLHS ITA-235; EF-3220; Admiralty E2014; NGA 9912. 1884. Active; focal plane 34 m (112 ft); three flashes every 10 s, white or red depending on direction. 11 m (36 ft) octagonal masonry tower with lantern and gallery, adjoining or attached to a 1-story masonry keeper's house. 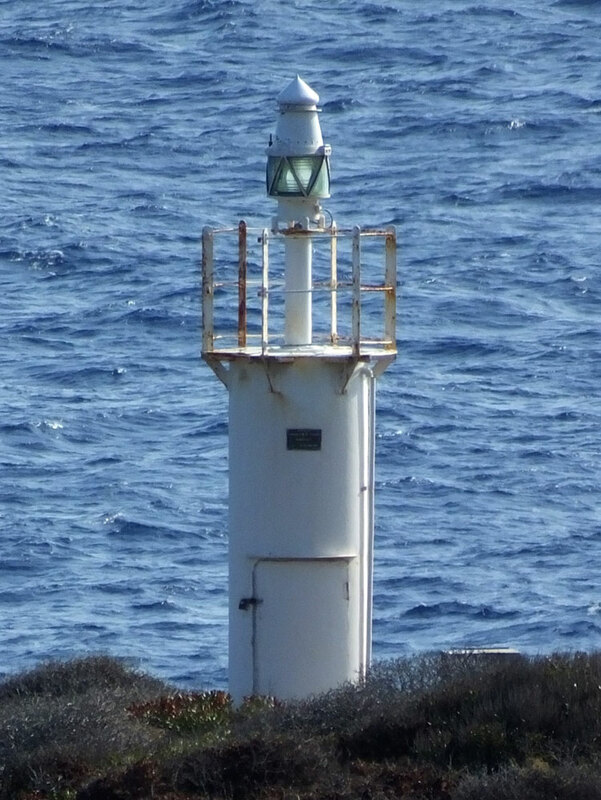 Lighthouse painted white; the lantern dome is gray metallic. Trabas has Klaus Potschien's photo, Hugo Pandit has another good photo, Marinas.com has aerial photos, Britta Bohn has a street view, and Google has a satellite view. Capo Zafferano marks the eastern end of the Golfo di Palermo. 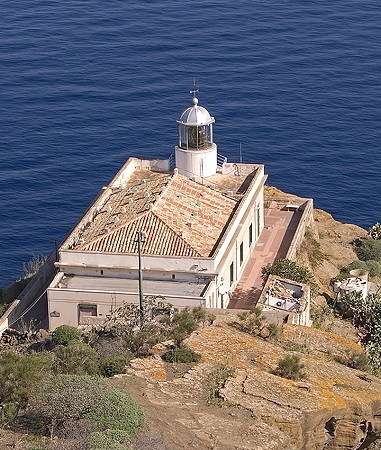 Located on the point of the cape, about 3 km (2 mi) north of Santa Flavia and 15 km (9 mi) east of Palermo. Site open, tower closed. ARLHS ITA-048; EF-3244; Admiralty E2023; NGA 9900. 1913. Active; focal plane 80 m (262 ft); white flash every 5 s. 26 m (85 ft) octagonal masonry tower rising from a 2-story masonry keeper's house. The tower is unpainted beige-colored masonry; the lantern is painted white with a gray metallic dome. Trabas has a great closeup photo by Arno Siering, a 2008 photo is available, Wikimedia has a view from the town's waterfront, Marinas.com has aerial photos, and Google has a street view and a satellite view. Located on a steep slope off the Via del Faro on the east side of Cefalù, in the middle of Sicily's north coast. Site open, tower closed. ARLHS ITA-008; EF-3261; Admiralty E2036; NGA 9860. Porto Empedocle (1863-1930s? ), Agrigento Province. Nothing remains of this lighthouse; it was probably destroyed in World War II. ARLHS ITA-303. Posted July 18, 2006. Checked and revised December 27, 2018. Lighthouses: 36. Site copyright 2018 Russ Rowlett and the University of North Carolina at Chapel Hill.